Vacuum Controller NVC-2100 - Oasis Scientific Inc.
start button or adjust other settings. level of vacuum and initiate evaporation while also regulating solvent “bumping”. dichloromethane, acetone, dichloroethane, chloroform, trichloroethane, ethyl acetate, benzer, benzene, and toluene). user to automatically regulate the pump via controller, including when to start and stop the operation. · Includes: NVC-2100 Vacuum Controller. nozzle) or Electronic Teflon Valve CV-2 (OD13mm hose nozzle), NVC Mounting Plate N-NVC 3. · Optional Accessories: Vapor Temperature Sensor Set. The NVC-2100 Vacuum Controller enables complete automation of the evaporation process. It comes equipped with an anti-corrosion semiconductor sensor that automatically regulates the amount of vacuum in the rotary evaporator condenser, improving the recovery rate of hazardous solvents. Implementing an electronic Teflon Solenoid vacuum control valve enables the user to variably regulate the amount of vacuum depending on the type of solvent being used. 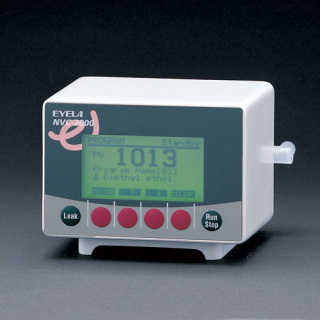 The LCD screen features vacuum measurement, pressure value, and vapor temperature (optional) settings in an easy-to-read display.